Take delight in the charming Italian must-visit cities in the winter time, avoiding the large tourist crowds. Explore top attractions from the Venetian Doge's Palace to the Baptistery in Florence to the Sistine Chapel in the Vatican with private guides. Welcome to Venice - one of the most charming cities of Italy. Upon arrival, you have a private water-taxi transfer to the hotel for the check-in. The rest of the day is at your own leisure to relax after the trip. After breakfast at your hotel, meet your private guide in the lobby and enjoy a wonderful walking city tour of all the must-see places. Your sightseeing program starts with a visit to St. Mark's Basilica, where you can see the astonishing Pala D'Oro altar. 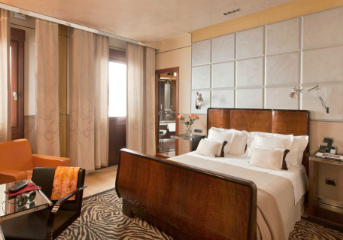 Next you go up to Loggia dei Cavalli to enjoy the best panoramic views of St. Mark's Square. Next on your list is the tour of the Doges Palace that includes crossing the Bridge of Sighs, visiting the old prisons and lushly decorated chambers of the Palace. After the tour return to your hotel and have the rest of the day at leisure or may go on an optional gondola ride. Today is reserved for you to explore and enjoy Venice on your own. We suggest visiting the Peggy Guggenheim Collection or stroll along vivid Venetian streets. In the afternoon you are met at your hotel by an assistant for a private water-taxi transfer to the train station. In about 2 hours you reach your next destination, Florence. Upon arrival, you are met by your private driver at the train station, who transfers you to the hotel for the check-in. The rest of the evening is free for you to relax. After breakfast in your hotel, meet with your private guide and go on a comprehensive walking tour of Florence's highlights. Today's program includes exploration of the Piazza del Duomo with a visit to the Baptistery dedicated to St. John the Baptist. Your ticket to the Grande Museo del Duomo allows you to visit the other magnificent monuments of Piazza del Duomo in your free time within 72 hours: the Cathedral itself, the famous Dome, the Bell Tower, and the Cathedral Museum with works by Michelangelo and Donatello. As you proceed to the main square of the city - Piazza della Signoria - you pass through the heart of the historical center with its landmark sites like Piazza della Repubblica and the Strozzi Palace. Stroll down via Tornabuoni, one of the most beautiful streets of the city, famous for its fine shops. We will also cross over the Arno River on the Ponte Vecchio to enter the Oltrarno district where you see numerous local craftsmen shops and the beautiful Santo Spirito Church and Convent, built for the Agostinians. In this very part of the city you can find an early work of Michelangelo dating back to when he was just 17 years old. During the tour we also visit the Galleria dell'Accademia to see Michelangelo's famous colossal statue of David, a must-see in Florence. After the tour return to your hotel and enjoy the evening at your own leisure. Today is reserved for you to explore and enjoy Florence on your own. After breakfast you can do some independent sightseeing, shop for souvenirs or have a good rest. We suggest visiting the Uffizi Gallery, the Pitti Palace or joining one of our carefully planned optional tours. Get an insight of Tuscany, Italy's famous region of great wines during the Tuscany Wine Trail tour. Explore the fascinating countryside of the Chianti Wine region. Explore one of the most recognized symbols of Italy during the incredible day trip on trains to Pisa and Lucca. See the Leaning Tower and the Italian gem Lucca. Spend time exploring the Uffizi Gallery which is home to an outstanding collection of art, including masterpieces by Michelangelo, Leonardo da Vinci, Raffaello, Botticelli. Following breakfast in your hotel, you check out and meet your private driver for a transfer to the railway station. An hour and a half later you arrive in Rome. Your driver meets you and takes you to your downtown hotel where you meet with your private guide and embark on a tour to discover the famous ancient treasures of the Eternal City. You have a taxi transfer to Rome's hallmark site - the Colosseum. Originally known by the name of Flavius amphitheater, it was the biggest and most imposing building of its kind in the Roman world, designed as an arena for the fights of Roman gladiators and could hold up to 70 thousand spectators. After touring Colosseum you proceed with a walking city tour to see the most famous attractions and hidden treasures of the Eternal City. You see the Spanish Steps, the Trevi Fountain, Pantheon, Piazza Navona, the famous Fountain of the Four Rivers, as well as witness the masterpieces by Bernini, Borromini, and many others. After the tour, your guide takes you back to the hotel and you have the evening at leisure. In the morning after breakfast, you meet your guide and walk to a walled enclave and the world’s smallest independent state - Vatican*. When inside the Vatican, you visit private apartments of Julius II, Pinecone Courtyard, Gallery of the Maps, Gallery of the Tapestries and Gallery of Candelabra. Next, you proceed to the Sistine Chapel, where you have enough time to admire Michelangelo's famous frescoes and learn about the intense relationship between Pope Julius II and Michelangelo that drove the artist to create the greatest work of art the world has ever known. Your tour continues in the vast open spaces of St. Peter’s Basilica where you see a stunning Pieta - a world-famous work of Renaissance sculpture by Michelangelo, and Bernini's impressive Papal Canopy, a legacy left to the Basilica by the Barberini family. The ending point of your tour is in St. Peter’s Square, where you can admire Michelangelo's Dome and the gorgeous colonnades designed by Bernini. After the tour, you are transferred to your hotel and have the rest of the day at leisure to enjoy the beauty of Rome on your own. *Please note: the Vatican is a sacred religious site thus the dress code for visiting it is applied just as when you visit any church in Italy: no shorts – no uncovered knees and shoulders, no backpacks. Today is reserved for you to explore and enjoy Rome on your own. After breakfast you can do some independent sightseeing, shop for souvenirs or have a good rest. We suggest visiting the Opera Theater, the Modern Art Gallery - Galleria nazionale d'arte or the Galleria Borghese or joining our carefully planned optional tour. Discover a layer of Roman history and explore one of the Eternal City’s underground catacombs and burial chambers, unfolding millennia of history hidden deep underneath the city. During the 2-hour tour inside the gallery, you dive in the Italian art of sculpture and paintings. Take a chance to witness masterpieces of Caravaggio, Bernini and etc. This is the last day of your amazing tour to Italy! After breakfast your driver meets you at the hotel lobby and takes you to the airport for your flight back home. We wish you a safe flight and hope to work on your future vacations! Recommended extension: If you would like to extend your Italian vacation, continue exploring its wonders with our extension to Naples or the Amalfi coast. Contact your specialist for details. Not included: international flights, multiple arrival/departure transfers, other meals not mentioned in the program, optional tours and services, all personal expenses. Relaxed pace with at least a 2-nights stay in each city with sufficient time to immerse yourself in the local culture.